While watching the Celtics lose to the Heat, the commentators said that the three leading Boston players were so old (four top players are 36, 36, 34, 27) that they ran out of gas in the fourth quarter of the seventh game. Same comment about old man Federer (31) not able to keep up with the young bucks Djokovic and Nadal (25 and 26). That is partly what makes this story so impressive…that a woman in her 70’s is able to keep up with climbers half her age and less, while defying death on the mountain. 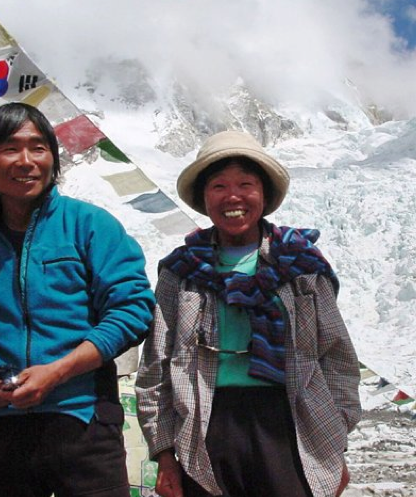 KATMANDU, Nepal — A 73-year-old Japanese woman climbed to Mount Everest’s peak Saturday, May 19, 2012, smashing her own record to again become the oldest woman to scale the world’s highest mountain. 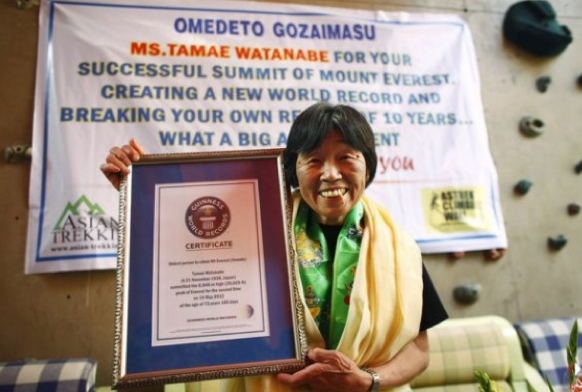 Tamae Watanabe had climbed Everest in 2002 at the age of 63 to become the oldest woman to scale the mountain, beating the 50-year-old record holder at that time. She had retained the title until she topped herself a decade later. Amazingly she found it a bit more challenging this time, because she broke her back in 2005! May is considered the best month to climb Everest, when climbers get about two windows of good weather for their bid for the summit. Unfortunately, so many climbers make the attempt at this time that there are bottlenecks, slowing down some ascents, and then people come down from the summit too late in the day or night. On May 19th this year, when Tamae set her latest record, three climbers died attempting to reach the peak. The first clear weather conditions of the spring climbing season were Friday and Saturday, but a windstorm swept the higher altitudes of the mountain by Saturday afternoon. An estimated 150 climbers reached the summit on either day, most of them on Saturday. There was a traffic jam on the mountain on Saturday. Climbers were still heading to the summit as late as 2:30 p.m. which is quite dangerous. Climbers are advised to not attempt to reach the summit after 11 a.m. The area above the last camp at South Col is nicknamed the “death zone” because of the steep icy slope, treacherous conditions and low oxygen level. With the traffic jam, climbers had a longer wait for their chance to go up the trail and spent too much time at higher altitude. Many of them are believed to be carrying limited amount of oxygen not anticipating the extra time spent. The three climbers who died Saturday were believed to have suffered exhaustion and altitude sickness. The oldest person to climb Everest is a Nepalese man, Min Bahadur Sherchan, who climbed Everest in 2008 at the age of 76.